Why is it that some teams work smoothly and effectively together, while others break down into internal conflict and achieve little? There are, of course, many reasons for this, but one of the main contributing factors is the interaction of different styles within the team. 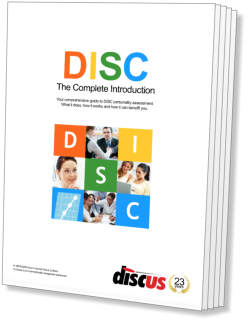 DISC can provide a useful predictor of team effectiveness, by highlighting possible problem areas and suggesting ways of resolving these problems. The ideal composition of any team is, of course, dependent on the task that the team is intended to fulfil. In general terms, however, it is true to say that the key to success in team-building is diversity. Each of the main DISC factors draws an individual to play a different part in the team structure, and a variety of factors across different team members can help to ensure that the team performs effectively. The Suitability Comparison section of the Style Card chapter describes interactions between different styles in detail. Rather than reiterate this information, this section will look at the four DISC factors, and the parts they have to play in the development and performance of the team. Dominance, being the factor of control, is particularly suited to a leadership role within a team. Dominant people have a natural urge to take command, and will fit easily into such a position. An important consideration with individuals of this type, however, is that the number of highly Dominant team-members should be kept to minimum. Several people attempting to take leadership within a team will clearly have a negative impact on team performance. Influence is the social cement of the team. Unless they possess specialised skills, highly Influential people often appear to have little practical part to play in team's proceedings, and are hence often undervalued. It is important to remember, however, that for a team to work effectively, its members must have a sense of cohesion, and this cohesion can often be achieved by the inclusion of one or two Influential individuals within the team. The communicative abilities of Influence can also produce a useful representative or spokesperson for the team, presenting their findings and ideas to others. Steadiness represents the team's 'brake', holding the other members back from ill-considered conclusions or precipitous actions. This is an important factor, especially after the team has formed its internal social relationships and has begun to perform its real function. A consideration to bear in mind with Steady individuals is their natural lack of assertiveness, which can often prevent them from making input unless directly requested, and it is often helpful to develop the structure of the team in such a way that the Steady members feel that their contributions will be valued and accepted by the other team members. Compliance is a factor important in actually achieving the results required from the team. Those members with high Compliance scores will tend to be the ones who generate ideas and produce materials and reports. The less pro-active side of the Compliant type, however, will normally require more assertive team-members (specifically Dominant and Influential types) to implement and monitor any plans or suggestions they may produce. The Compliant members of the team are often those who possess the specialised skills and knowledge appropriate to a project. For any team to be effective over the long term, regardless of its constitution, it must pass through an initial period of flux and uncertainty before it will begin to perform, during which relationships and roles within the group are formed. This formative period is an ideal time to introduce any formal structures considered necessary to the smooth running of the group.